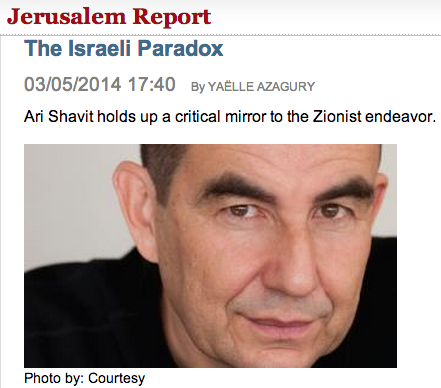 Ari Shavit is a journalist for the liberal newspaper Haaretz, and was once part of the Left’s Peace movement. But there is little political correctness in this independently-minded and non-partisan look at Israel in his new book “My Promised land”. Shavit’s greatest achievement in his anatomy of Zionism is to transcend the oversimplified and repetitive clichés of Left and Right. The author captures in penetrating language the tragic poignancy of the Israeli predicament: “On the one hand, Israel is the only nation in the West that is occupying another people. On the other hand, Israel is the only nation in the West that is existentially threatened. Intimidation and occupation are the two pillars of our condition”. Using archival documents, testimonials and interviews, he argues that this duality (“occupation-intimidation”) was at the heart of Zionism from its outset. But while the issue of appropriation of Palestinian land (sometimes conquered, often purchased) was handled with uncanny tact and dexterity prior to the creation of the State of Israel and during the subsequent 25 years, the delicate balance between one people’s imperative need and another people’s indigenous land was shattered in 1973 after the Yom Kippur war. What happened? First let me note Shavit is an ardent Zionist. The most powerful and well-known arguments in favor of Zionism are anti-Semitism and the Holocaust. As Shavit ponders the fate of European Jewry standing on the brink of destruction just before World War II, he notes: “in 1935, Zionist justice is an absolute justice that cannot be refuted”. But there is also another argument holding true today more than ever. Shavit is the great-grandson of Herbert Bentwich, a British Jew and well-to-do lawyer who realized that his tranquil Anglo-Jewish life was endangered, in the process of being softly killed by the dominant culture. So he decided to forego the comforts of civilized London to set off for Palestine in 1897 for a transformative twelve-day visit. From that point on he lived in continual dialogue with the Land of Israel until he made aliya three years before his death in 1932. Furthermore, notes the author, a look at American Jewry today should persuade most skeptics. Given the high rate of intermarriage in 2010, non-Orthodox Jews are drifting away from the center of gravity of Jewish identity. They are evaporating into the non-Jewish space. He concludes: “Benign Western civilization destroys non-Orthodox Judaism.” In other words, it is death by the kiss. The Zionist endeavor is the subject of the first half of the book, which borrows in its style and breadth from the noble genre of the epic. Shavit’s prose is taut and stripped down like Zionism itself, but its rhythms are generous and embracing. The community of Ein Harod is, for Shavit, kibbutz socialism at its best and most inspiring. He praises its communal effort, Spartan determination, and revolutionary spirit transformative of soul and body. Examining how these men and women conquered a wasteland, crafting an entire country out of nothing, Shavit’s writing has Biblical accents, even though he is himself secular. It describes the end of the Jew of the Diaspora, feeble and submissive, and with the return to Zion, the birth of a new man. There is a symbolic moment in the book when the settlement of Rehovot southeast of Jaffa, which struggled against the odds to grow oranges, starts shipping the famous Jaffa citrus to Buckingham Palace in the 1930’s. The old subordinate condition of the court Jew is rendered obsolete by Zionism’s successes. Jews will no longer lower their heads in front of foreign kings. From now on they will trade with them. Zionism got almost everything right in those crucial years leading to the creation of the state. There were certainly frictions with the Arabs, but they were limited: overall there was yet no Palestinian identity in the modern sense. Because up until 1917 Palestine was a backward province of the Ottoman Empire, Arabs were often grateful to Zionist immigrants who taught them hygiene, and brought with them medicines and modernizing techniques to cultivate the land. Later on, in the days before 1967, Israel displayed in Shavit’s words, “a security-mindedness that was not imperialistic. A patriotism that was not chauvinistic.” This was exemplified in the building of a nuclear reactor near Dimona to be used solely as a psychological deterrent. The Jewish State’s nuclear doctrine is both modest and successful: Israel will be a nuclear power but act as if it were not. In fact, concludes Shavit, the origin of the crisis is rooted in Zionism’s dual nature, as unmasked most flagrantly by the massacre carried out in the Arab village of Lydda. In the summer of 1948, during the War of Independence, Zionists realize a Jewish State is endangered by the Arab city of Lydda: so 200 people are killed and tens of thousands of Palestinians are forced to leave. Herein lies what Shavit views as Zionism’s “black box”, its darkest secret. From 1973 onwards, Shavit chronicles a major shift in Zionism. Having lost its social glue, it is adrift, incapable of producing a renewed social contract, or of striking that perfect balance of responsibility, audacity and cunning it had fine-tuned until then. Zionism’s inherent paradox and Janus-faced nature-on the one hand idealistic, on the other, pragmatic, if not belligerent – is blatantly exposed. Consequently, Israel has become a collection of multiple interests with little common ground. From novelist and peace activist Amos Oz to Sephardi political leader Aryeh Deri to Jewish terrorist Yehuda Etzion, Shavit interviews the protagonists of Israeli life with infinite reserves of sympathy. They all have their flaws and claims, yet Shavit understands them intimately. He is kind, generous, a consummate interviewer. He finds the settlements anachronistic and imperialistic, but he realizes his own Zionism shares more than a few genes with the Zionism of the settlers of Ofra (home of Yehuda Etzion), which he sees in a sense as “Ein Harod’s grandchild.” He considers Shas’ Aryeh Deri inscrutable, lost in a faraway place between identities, but he likes him and understands his plight as a Sephardi whose history was delegitimized by, in Shavit’s phrase, the WASPs (White Ashkenazi Supporters of Peace). He is close to the Palestinian-Israeli attorney Mohammed Dahla [SIC] who co-founded in 1995 the Legal Center for Arab Minority Rights in Israel (Adalah), but he knows there are great differences in their worldviews. So if the first half of the book that chronicles Zionism’s rise reads like an epic, heroic and grand, the second half – which traces its unraveling – is like a novel, sympathetic, intimate, but also a testimony to a shattered reality. Zionism’s post-1973 phase has myriad yearnings and projects, but as an ideology it has become fragmented, and has forsaken its prior cohesiveness. For Shavit, Israel is on the edge of the abyss. Because too many fires are burning, Israel has lost sight of its greatest threat: Iran’s nuclear program. Hardly a hawk, Shavit warns us, however, that this is the state’s most frightening challenge. We’ve come full circle: the book started with existential fear, and closes with existential fear. Complex, intricate, sophisticated, Shavit’s reflections are steeped in a love for truth and genuine humanism. I disagree however with some of them. For instance, I find his analogy of a Gaza detention camp with a Nazi concentration camp a vexed one. While I understand his thought process, influenced by Hannah Arendt’s theory of the banality of evil – evil preys upon us in banal ways – I believe he creates a flawed moral equivalence. We feel somewhat claustrophobic at book’s end: is there no exit? Will this be Israel’s end? Shavit’s capacity to argue one point from diverging perspectives is maddening, but so are Israel’s choices. It is the lot of democracies to get caught in the very contradictions they are so desperately striving to resolve. France, for instance, must always strike a fine balance between its equalizing and its centralizing tendencies. America, as Alexis de Tocqueville once noted with great insight, is pulled apart between its individualism and its conformism. The greatest test faced by democracies – and the issue is central for Israel because its survival depends on it – lies in their ability to overcome those contradictions. Yaëlle Azagury is a free-lance reporter who writes about contemporary literature and culture.